The 3.5-inch Super-Ride suspension system is an ideal system for the discerning Cherokee owner who desires a more aggressive look, higher ride stance and better trail performance, but still wants to retain factory like on-road handling and ride quality. The replacement RE Super-Ride™ lower control arms eliminates the weak factory arms, without inducing any additional road noise or vibration by retaining the stock bushings in the control arms. 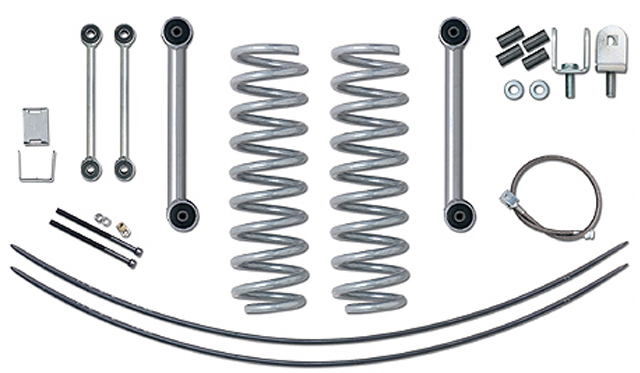 This system adds an add-a-leaf to your XJ's rear factory leaf springs. This system is capable of fitting 31x10.50-inch tires. RE1480 ~ SPRING CLAMP CLIP 2.5"
RE1482 ~ REPLACEMENT CENTER PINS 5/16"